It’s fall and I’m in love. 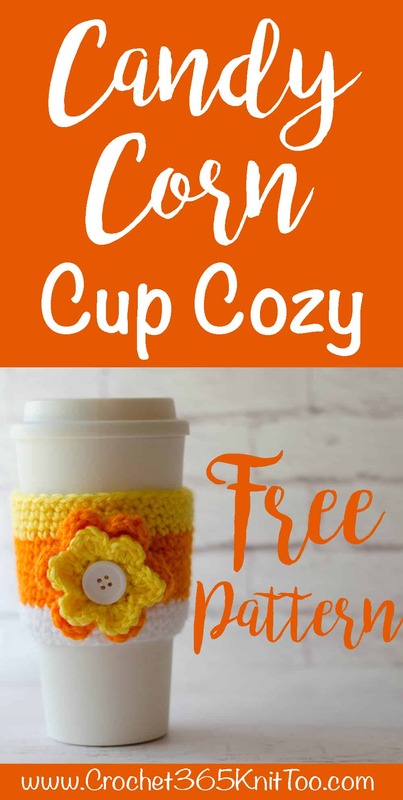 In love with this very simple and super sweet crochet candy corn cup cozy. A fall walk in the mitten state is a beautiful thing. The cool, crisp air, the beautiful trees and the leaves that scurry away in a soft breeze as you walk on through. So put on a sweatshirt, pull on some jeans and go for a walk! And when you come back, brew some coffee and make yourself this little bit of goodness for your coffee cup. 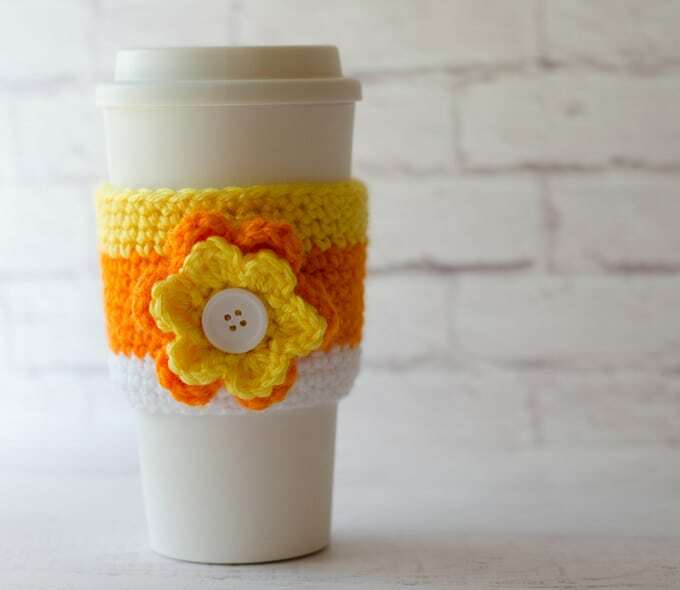 Cup cozies are about the easiest thing to crochet. You may remember the watermelon cup cozy. I may have been in love with that one too. But she is a summer friend and now it is fall and so it is time for a new cozy. 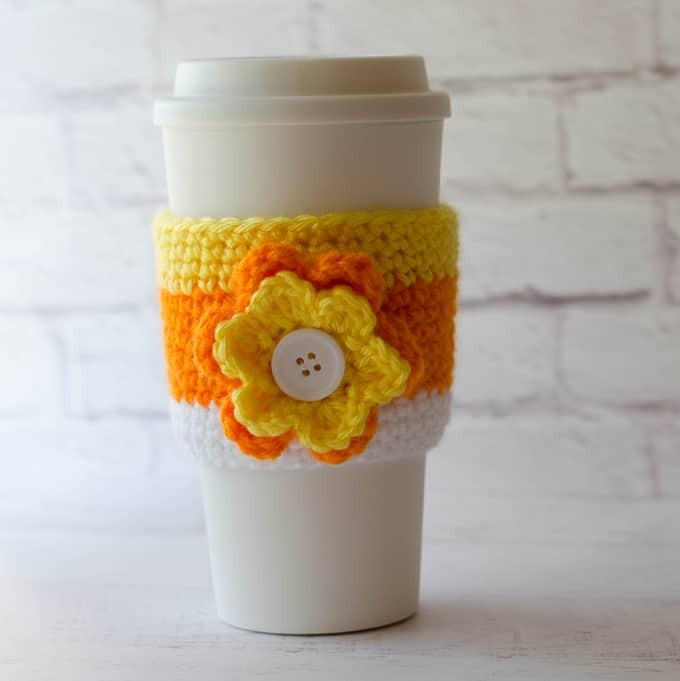 This crochet candy corn cup cozy reminds me of sunshine and it makes me smile. You might even want to make one for a friend. This post may contain affiliate links. By clicking on one of these links, a portion of the purchase will go to support this blog. The price you pay will not change. Thank you for your support. worsted weight yarn in White, Orange and Yellow. Here’s the most important part. Before you join your chain, hold it around the cup you are making it for. It should be a snug fit. If you can’t touch the 2 ends of the chain, add a few more chains until it meets. If your chain is loose or overlaps, undo a couple of chains. When it is the right length for your chain and cup, carefully join it to the first stitch, making a large loop. R1-3: Ch 1, sc in same stitch as joining and in each stitch around. Join to 1st st.
R4-9: With orange ch 1, sc in same stitch as joining and in each stitch around. Join to 1st st.
R10-13: With yellow, ch 1, sc in same stitch as joining and in each stitch around. Join to 1st st.
For the flowers, I used the Easy Crochet Flower Pattern here. I made the smaller size in yellow and the larger size in orange. I found a white button in my stash and sewed it on in the center, connecting the whole flower to the cup cozy. And there you go! A little bit of sunshine goodness into your fall day!